The Shop at the Old Rectory will be closed for the month of January and regular hours will resume on Tuesday, February 5th, 2019. The WHS Shop at the Old Rectory sells an ever-changing variety of conversation pieces – new and donated or consigned vintage treasures such as silver and brass accessories, pottery, porcelain, jewelry, glassware, quilts, linens, artwork, crafts and Society merchandise. 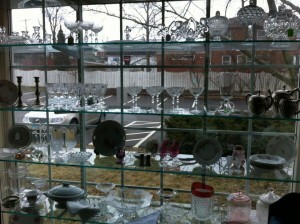 The shop is definitely a “must see” place if you’re seeking a special Worthington gift. We do not have the ability to process Charge or Debit cards. Please fill out the online form; make all payments by check. All collectibles and antiques sold at the Shop at the Old Rectory have been donated or consigned specifically to the shop. The Shop at the Old Rectory is the only place in town where you can buy the “fixings” for making delicious Home-made Worthington Bean Soup. We even have bean soup packaged specially for Christmas giving. Each container (jar or plastic) includes our special mix of dried beans and spices as well as two different recipes with cooking instructions. Descriptions of 37 properties from a prehistoric HOpewell Indian Mound to Toll Gate Square, Worthington’s first condominium complex. Soft cover. The book costs $10.00, Ohio Sales Tax is $.75 adn shipping is $3.20. 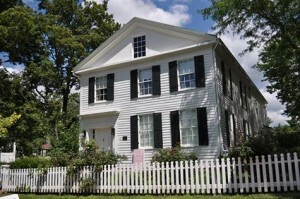 Although surrounded by the Columbus Metropolitan area, Worthingtonians like to think of their city as a distinctive community – retaining characteristics of the nineteenth-century village that was platted in New England, settled a decoad before the city of Columbus, and serving as the market center for surrounding farms well into the 20th century. This includes narrative histories and plat maps of twenty-three neighborhoods, and an index of ninety-two neighborhoods wit their date of formation, location and plat book reference in the county recorder’s office. Soft cover,65 pages. The book costs $12.00, Ohio Sales Tax is $.90 and shipping is $3.20. A comprehensive, lively account taken from many primary sources of Worthington and its people between 1802 and 1836. Soft cover. The book costs $23.oo, Ohio Sales Tax is $1.73 and shipping is $3.20. Part of the “Images of America” series, Around Worthington tells the story of Worthington history with nearly 200 photographs. Soft cover, 128 pages. The book costs $19.99, Ohio Sales Tax is $1.50 and shipping is $3.20. The walking tour includes 18 sites with the history of the property and architectural details. Drawings for each site by Worthington artist Lynn Bird. Soft cover pamphlet. The pamphlet costs $1.50. If you would like it mailed to you, the cost is $2.00, which includes tax and postage. A book about Worthington, Ohio, featuring sections on prehistoric peoples, James Kilbourn and Thomas Worthington, Confederate General Roswell Ripley (defender of Charleston and Conqueror of Ironclads), Col. Tom Worthington (and his struggle against Generals Sherman and Grant), Worthington today, and the influences of an active historical society. 175 illustrations, 39 in color. Soft cover, 226 pages. The book costs $25.00, Ohio Sales Tax is $1.88 and shipping is $3.20.